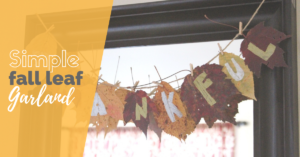 Simple Fall Leaf Garland is a perfect craft for a rainy fall afternoon. It does require a simple prep—collecting the leaves and either pressing them or drying them. I usually just stick them between the pages of my very big cookbook. You do not need to dry your leaves for a very long time in order to use them to make this simple fall leaf garland. One or two days is the minimum. If you use freshly picked ones, the leaves will curl up by the end of the day, and your garland will be looking pretty sad. So make sure to go outside, enjoy some of that gentle fall sunshine and pick some gorgeous fall leaves for this project. The National Teacher Appreciation Week is almost here! Today I’ll share with you a super easy and personal craft for your teacher, which you can do it with your kids in 1 hour. It’s Teacher Appreciation Simple Handprint Card! Every year I get excited to come up with fun and unique ways to say “thank you” to our educators. I would go as far as say that we should show love and appreciation for our teachers every day of the year. But having an official designated week of appreciation is certainly a wonderful reason to shower our hard-working teachers with a little extra attention. It’s also a great excuse to get creative and make some fun crafts with the kids!